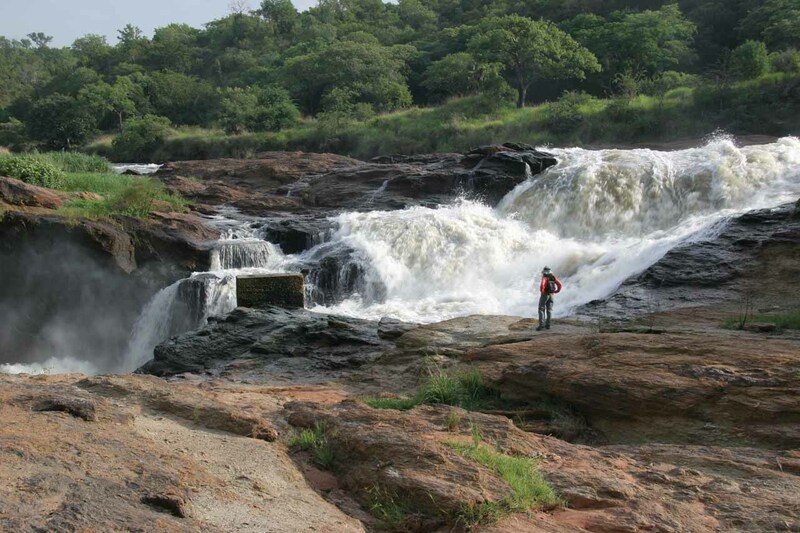 Murchison Falls (also known as Kabarenga Falls) was perhaps Uganda‘s most famous waterfall. What made this waterfall a real memorable experience for us was the rare opportunity to combine a waterfalling excursion with the chance to see big game wildlife. Add to that the odd distinction that this could possibly be the world’s most “powerful” waterfall in terms of the force of water ejected from the falls itself. 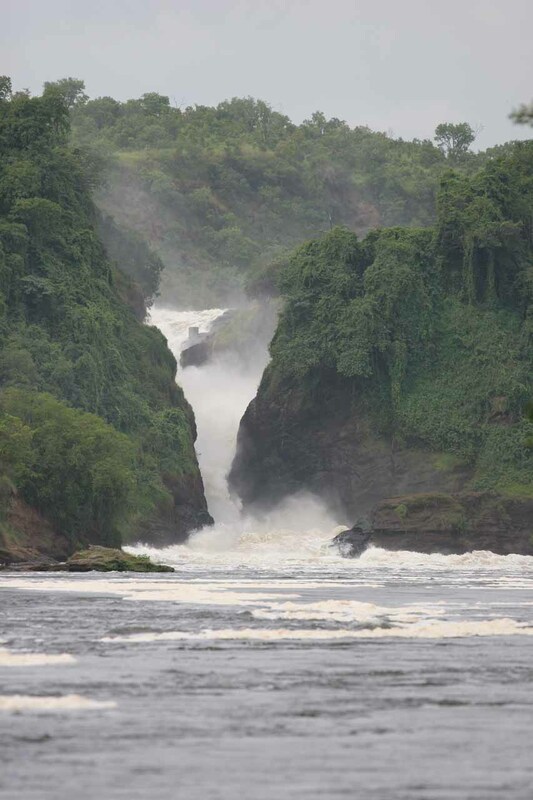 We felt this notion had some credibility based on our observation that the wide Victoria Nile River was squeezed into a 6m width chute at the base of the roughly 20-30m tall falls. This place was once world famous for an abundance of wildlife on the river cruise up to the waterfall itself. This status was maintained up until the 1960s. Then, the cumulative effects of poaching, wars, and residual rebel activity in the country’s north (bordering Sudan) took its toll on the ecosystem here. Such events resulted in the indiscriminate slaughter of much of the big game including the big cats (e.g. lions) that were now no longer present. 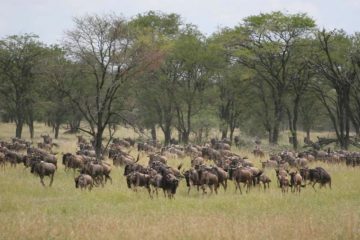 Since those turbulent times (especially post Idi Amin regime and post war with Tanzania and its aftermath), we sensed the area experienced a resurgence in ecosystem recovery and wildlife. As a result, the accompanying tourism soon followed. 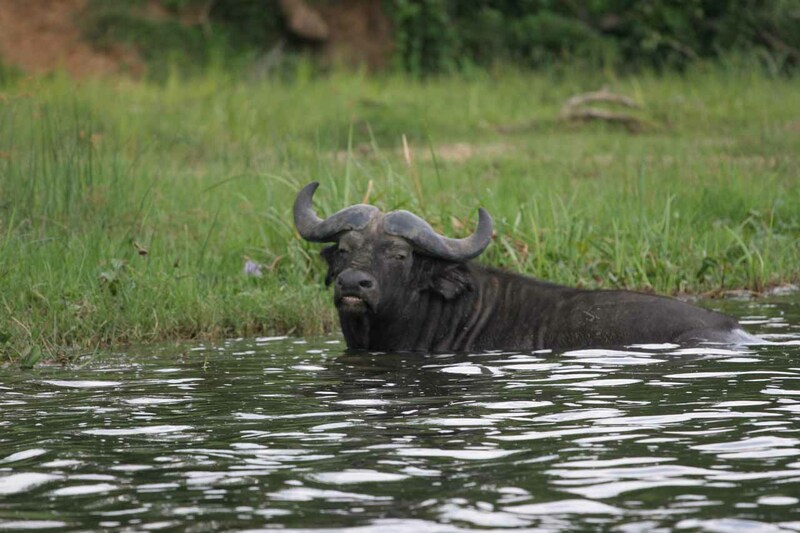 Corroborating this sense of recovery, we managed to see a variety of wildlife along the Victoria Nile that included numerous sightings of hippos, crocodiles, elephants, cape buffaloes, water bucks, and numerous birds. 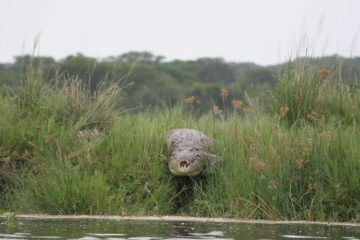 Just to give you an idea of how abundant the wildlife was on this visit, it was way more impressive than our sunset cruise on the Zambezi River above Victoria Falls, which was an area that did not quite suffer the same human-induced trauma on the ecosystem. As for the waterfall itself, it dropped in multiple cascading stages where some of the river split apart and eventually rejoined partway down the overall descent of the falls. 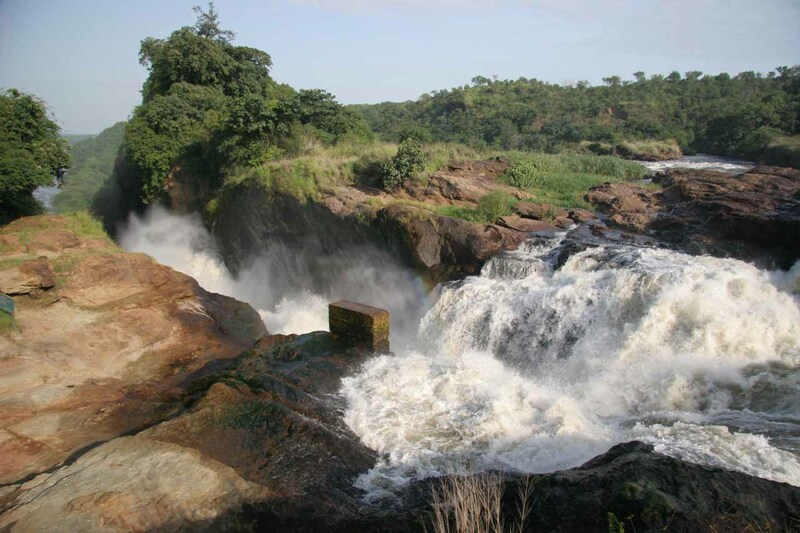 It would turn out that much of the falls was somewhat concealed thanks to its position within the depths of that tight chute that left the Victoria Nile squeezed and churning, which thus created plenty of mist and turbulance. Combining all of these effects, it certainly seemed to us that this waterfall certainly didn’t fit the classical definition of what a waterfall would look like thanks to this cascading characteristic as well as its chaotic appearance. But we felt it was this uniqueness about the falls that made it very memorable. 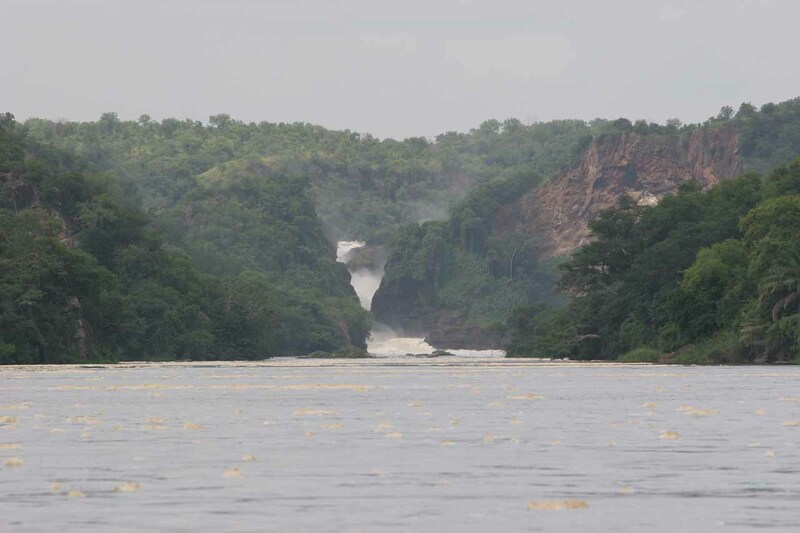 We ended up experiencing Muchison Falls in two very different ways. 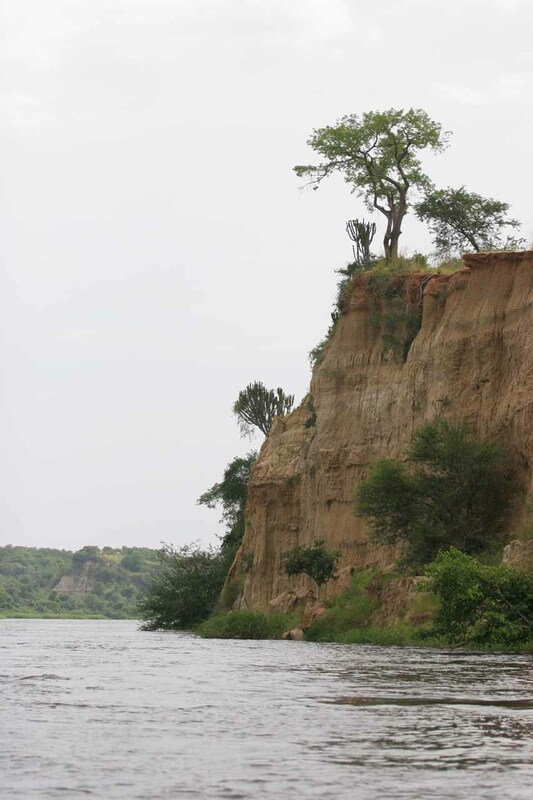 As alluded to earlier, we were able to combine a wildlife safari with waterfall touring through a boat tour on the Victoria Nile. Conversely, we got to experience the falls by being driven up to the top of the falls for viewing that was more about observing the turbulence of the falls itself and less about the big game wildlife. I’ve decided to describe separately each excursion and some logistics in addition to what’s described immediately below. That way, we can paint a clearer picture for you about the experience and the logistics of a visit to Murchison Falls. 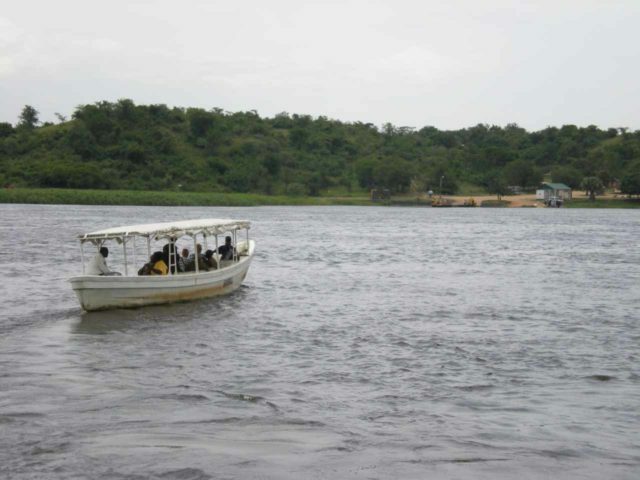 The first way we experienced Murchison Falls was through a boat safari on the Victoria Nile River. This was probably the must-do excursion regarding this waterfall because it was the one that allowed us to combine waterfalling with big game wildlife spotting. In fact, it was this wildlife spotting exercise that really made us better appreciate the inherent dangers of sharing the river with denizens such as the Nile Crocodile and the very territorial (and violent) hippopotamus. 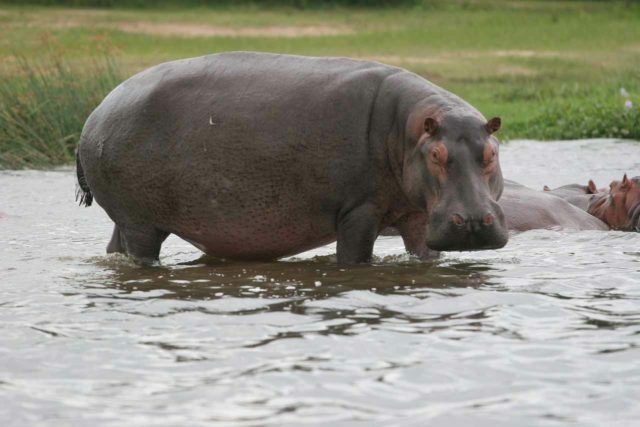 I recalled there was one instance when an unhappy hippo dove into the river upon seeing our boat, then tried to ram us from the bottom as it re-emerged right where our boat had just vacated the premise! To further the sense of how we were part of the food chain in this ecosystem, there was one group of hikers who used the boat tour to reach the start of a trail that would take them from the river to the top of the falls (we would get there in a different way, which we’ll explain in the next section). That group was accompanied by a soldier who was wielding a semi-automatic assault weapon as a precautionary measure in case there was a wildlife encounter! Eventually, the boat safari would reach its dead-end in front of the turbulent Murchison Falls. However, the boat couldn’t get us very close to the falls given the fierce current as we got closer. So it was a good thing that we brought a telephoto lens to bring the waterfall closer in our photographs. As a matter of fact, the same thing could be said about wildlife photos as well. Given the turbulence of the river near the falls, we saw lots of white foam accumulating around the falls itself. We weren’t sure why this was the case (could it be because the river was full of bacteria or other microbes? ), but it was certainly something worth noting. By the way, this foaming section of the river was also known as the Devil’s Cauldron. And when we had our fill of the falls from this perspective, we headed back the way we came. 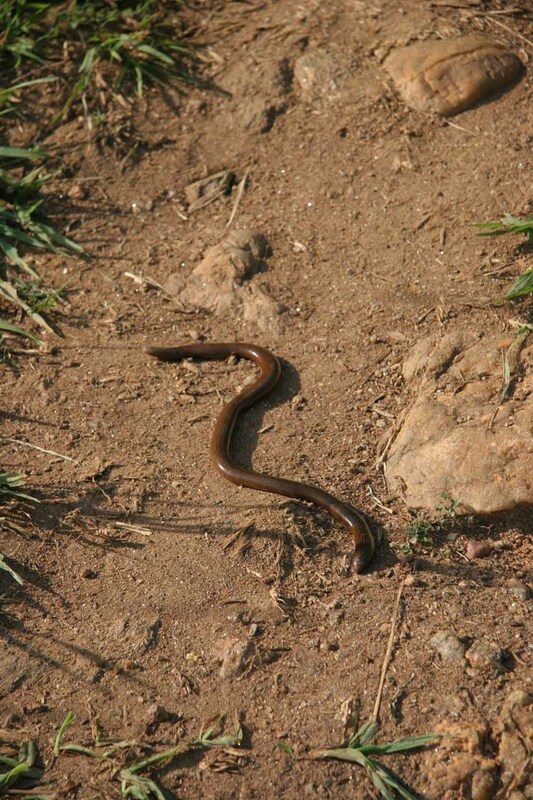 So that meant getting a chance to see more wildlife on the return. The boat cruise lasted about 2.5 hours. We began our tour at 1:30pm and it ended at 4pm. 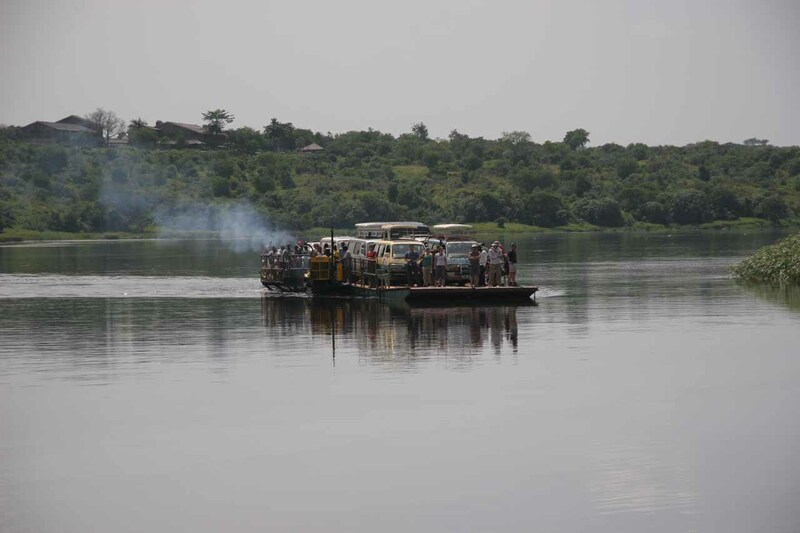 As for the logistics of this tour, we had to make sure that we caught the 12pm Paraa Ferry across the Victoria Nile River as the tour began from the northern banks of the river near the ferry crossing itself. 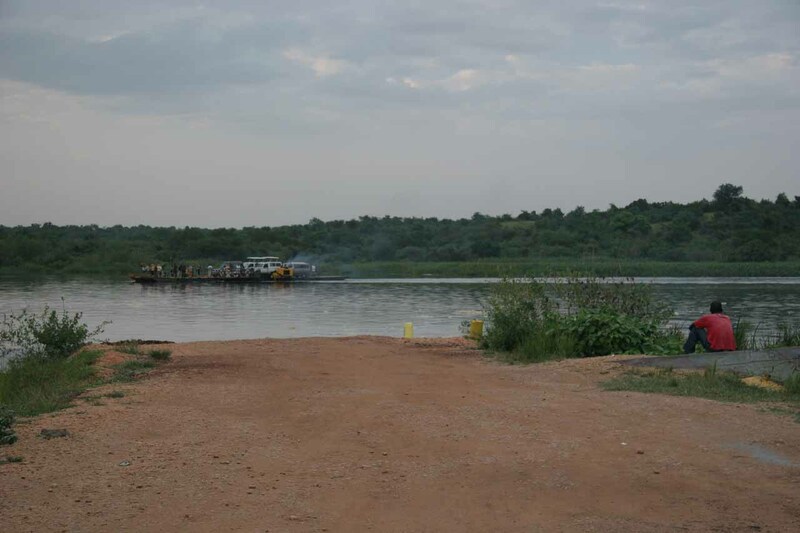 It took us a very hasty 75 minutes to drive from the Murchison Falls National Park gate to the ferry crossing. Had we missed the ferry, we feared that we would’ve missed our boat tour (the next ferry was said to be after our pre-booked boat safari tour), and that was why we rushed to get here (it turned out that our haste eventually led to our tour driver’s van getting a flat tire). 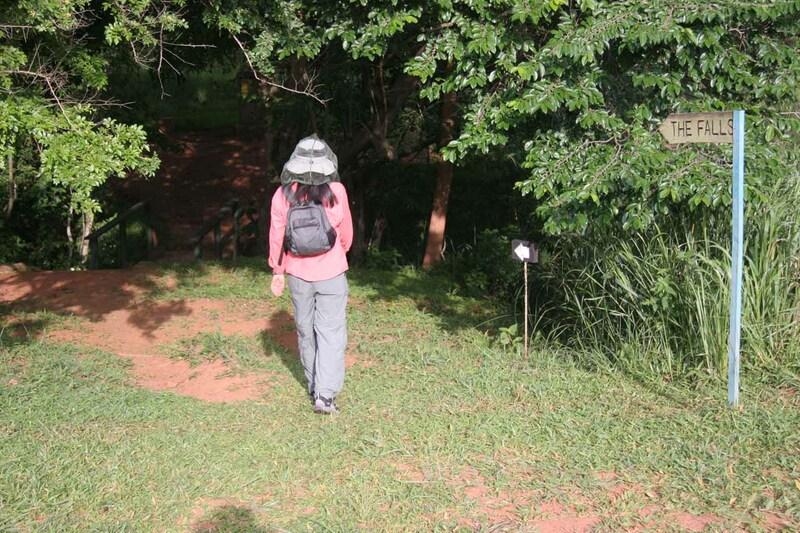 One last thing we should mention is that despite the humidity of the general area, we had cover ourselves as much as we could to avoid getting excessively bitten by tse tse flies. For these insects (which looked like ordinary flies), DEET didn’t work against them. The risk of a bite by these flies was the transmission of a parasite that might effect the brain and lead to cerebral disorders. 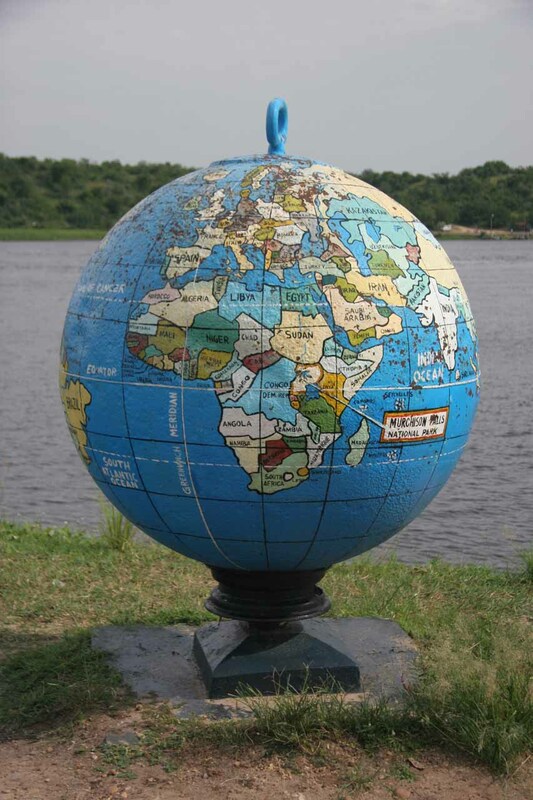 We noticed throughout Eastern Africa that locals tried placing dark blue and black banners or flags tied to trees. The thinking behind this was that perhaps this might trick tse tse flies towards these flags into believing they might be large mammals (as anything large and dark must be something that could be a potential source of blood). 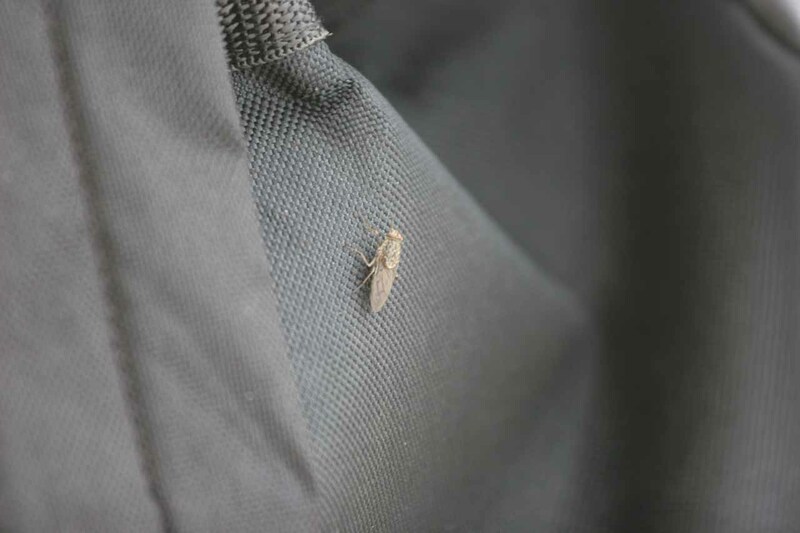 We weren’t sure whether this was totally effective or not, but the moral of the story here was that you might be able to minimize the likelihood of tse tse fly aggression if you wear light colored clothing (as opposed to dark-colored clothing). 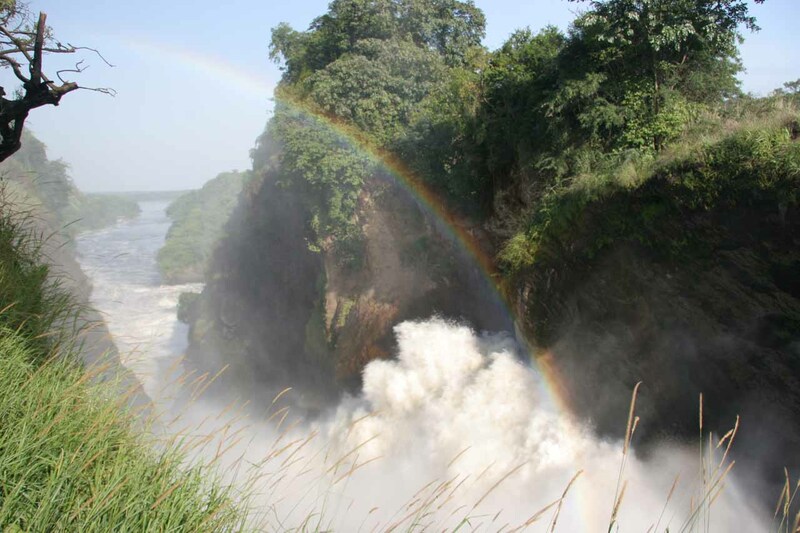 For a more intimate experience at Murchison Falls, we were also able to visit its top. We were under the impression that not many tours let alone tourists include a visit to this part of the falls as part of a typical itinerary. A separate road branched off the main one that connected the park’s gate with the river ferry. The turnoff was probably about 20 minutes or so east of the south bank of the river ferry crossing along that main road. 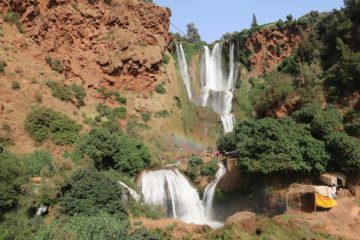 Once we were at the small unpaved car park there, we walked down a short path that led us right to the precarious brink of the falls. We had observed there were some rectangular support columns on both sides of the river going over the falls, and we suspected that there might have been a bridge that used to be here. We had to exercise caution so as to not get swept into the river as its brink had no guard rails. However, as we walked towards the main overlook of the falls, there were some fences put in. It was from this vantage point that we could look over the top of the falls and towards the Devil’s Cauldron. 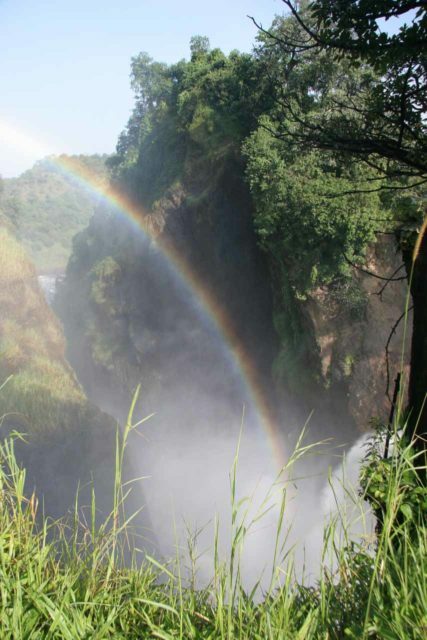 On the morning of our visit, there was enough mist being thrown in the air to generate big and bold waterfalls. It was also from this vantage point that we could appreciate the size and magnitude of the falls even though most of the pictures we took didn’t seem to do it justice. 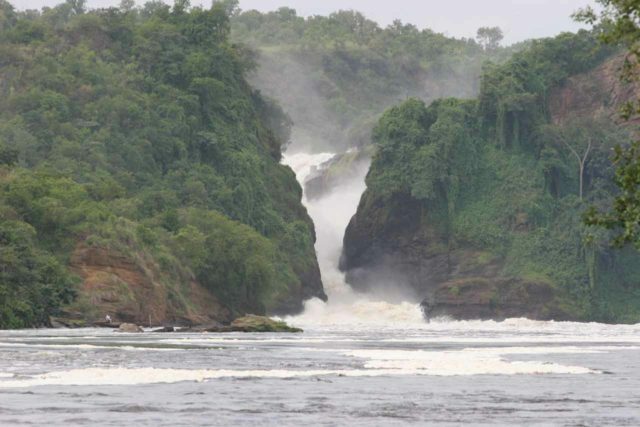 Perhaps the one photo we took that might have communicated some sense of power and scale of Murchison Falls was shown at the top of this page. Indeed, we thought this could very well be one of the few waterfalls we’ve seen where the viewing experience might have been better from its top than from its bottom. In our experience, waterfalls were almost always better seen from its bottom than its top. 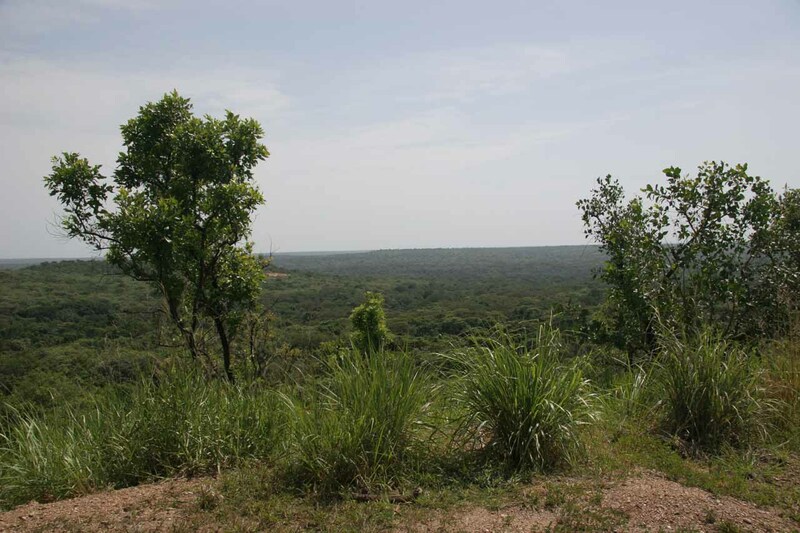 In any case, Julie and I spent a little over an hour, which was plenty of time to appreciate Murchison Falls and the surrounding landscape. 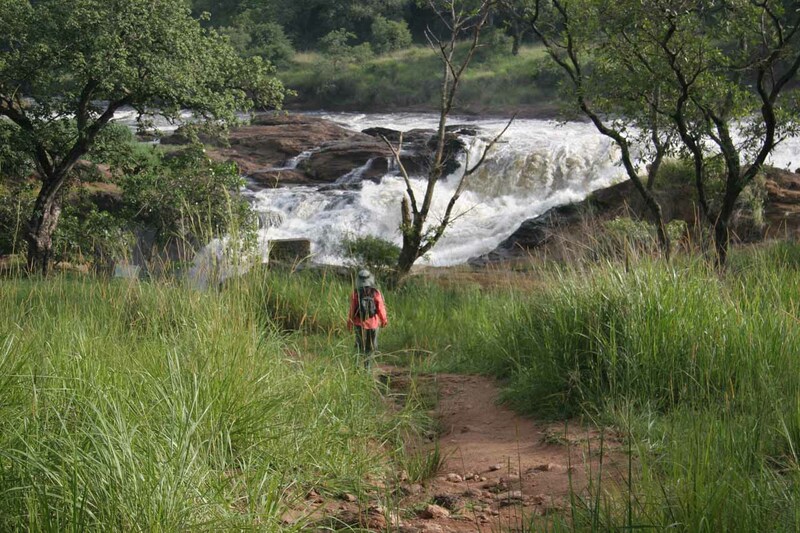 Finally, as alluded to earlier, we did witness a group of hikers who managed to combine this experience at the top of Murchison Falls with the boat safari. Since we didn’t exercise this option, we’re not sure of how the logistics would work out, but at least we know it is definitely possible. 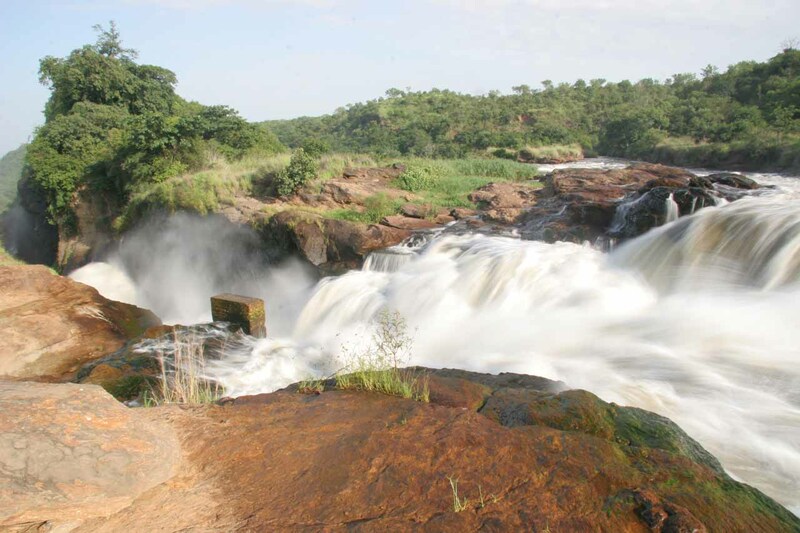 As for getting to the Murchison Falls National Park itself from Kampala, we had to make a very long drive (possibly around 5-6 hours) from the city to the reserve. Even though it would appear the drive shouldn’t take that long (at least from looking at the maps and distances), we had to contend with potholed roads for most of this leg of our journey, especially after leading north from Masindi. As a result, the pace of travel was significantly slower than what we were used to coming from an industrialized country. If road conditions would improve, then I could imagine this drive taking as little as four hours or less. 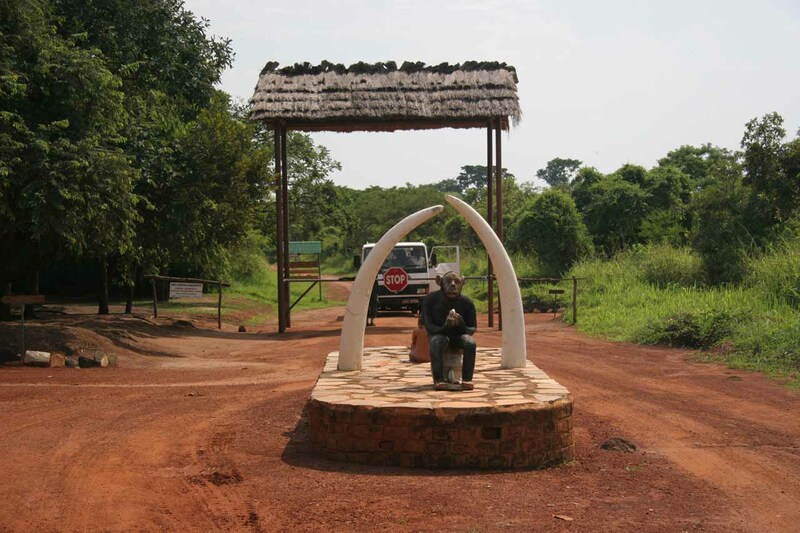 There would be more driving (on unsealed roads) that was necessary to make it from the park entrance (I recalled there was an interesting-looking monkey statue fronting its gate) to the banks of the Victoria Nile River. This part of the drive would typically require another 90 minutes or so, but we made haste (for reasons that will become clearer later in this page) so it ended up taking us closer to 75 minutes plus an eventual flat tire. Overall, this drive would be 211km (where GoogleMaps claims this was a 3 hour drive). However, our experiences have shown us that the roads here required us to move much slower thanks to large potholes. Thus, the GoogleMaps estimates were really too optimistic compared to the reality of our actual speeds and pace. 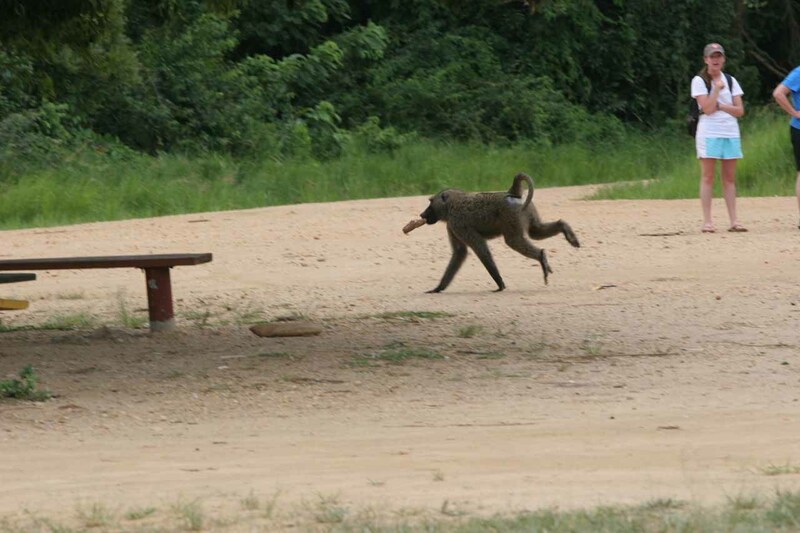 For an extended stay in the park, the area was also known for rare chimpanzee sightings. 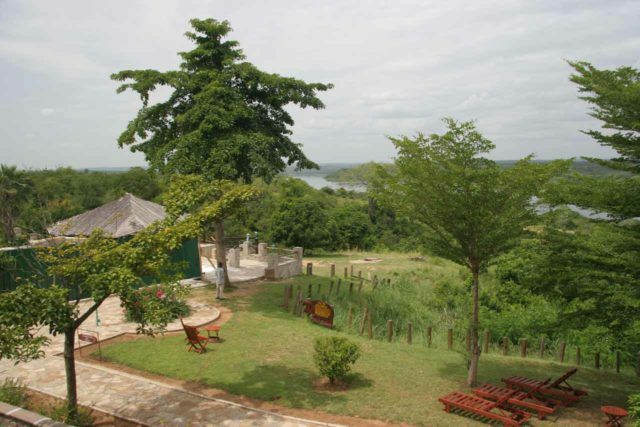 Since we only spent one night here (at the Paraa Safari Lodge), it wasn’t possible on our June 2008 visit. 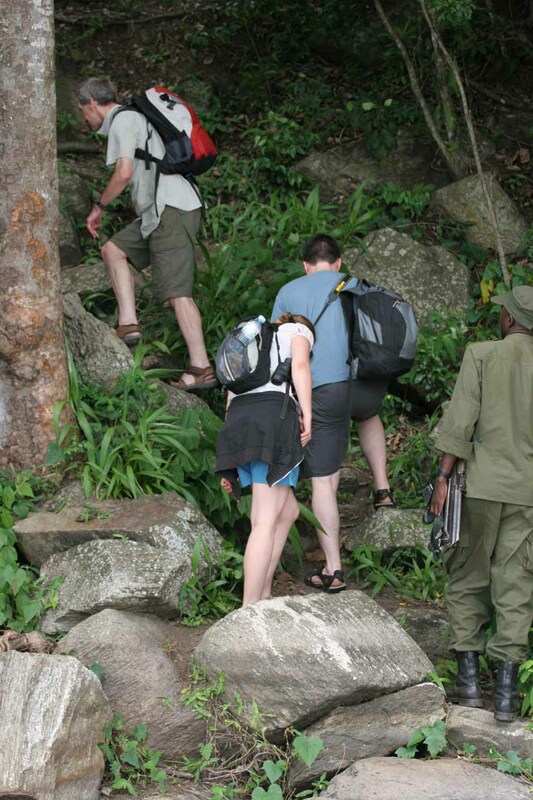 We hope to be able to return here under less haste and truly experience the wildlife to be found in Uganda (especially the gorillas and chimps, which we didn’t do on this go around).